“In India, around 20 percent of the greenhouse gas emissions come from the agricultural industry, there is a huge pressure on the government to reduce this"
Research from the James Hutton Institute will be utilised in a new initiative, with a potential spend of 1.2 billion dollars, aimed at tackling climate change and reducing greenhouse gas emissions (GHG) in India. One of the major impacts of climate change is soil degradation where estimates report that India is losing 5,334 million tons of soil every year due to soil erosion. Farmers in India are suffering from financial insolvency and biologically bankrupt soils due to the high costs and low returns of intensive, chemical-based agriculture. This has led to the Andhra Pradesh (AP) government and Azim Premji Philanthropic Initiatives (APPI), to create a project where 500,000 small-holder farmers will convert from conventional agriculture to Climate Resilient Zero Budget Natural Farming (CRZBNF) practices. In Andhra Pradesh alone about 27% of the area suffers from severe soil loss (15-20 t/ha/yr). The objective of the Initiative is to assess and promote the potential to simultaneously achieve and measure reduced GHG emissions. Expertise from the James Hutton Institute will help support the state government in developing a cost-effective, scalable, reporting system to enable the measurement of GHG emissions. Data will also be captured on the other ecological and social-related benefits of moving from chemical-based agricultural systems to CRZBNF. Dr. Jagadeesh Yeluripati from the Institutes Information and Computational Sciences group was invited to meet with the agriculture minister for the region. He also chaired a section at a workshop held on the subject. He explained “In India, around 20 percent of the GHG emissions come from the agricultural industry, there is a huge pressure on the government to reduce this. It is one of the only industry in the country where a substantial reduction is possible. The project is being implemented on a massive scale, which is not possible in many other regions. APPI is supporting this gigantic initiative touching the lives of 500,000 farmers to practice CRZBNF in the next 3 to 5 years. It is hoped this will progress to 5 million in seven years’ time. 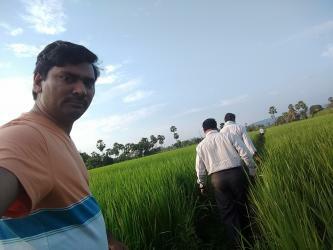 From a farmer focus the implementation of CRZBNF is a co-beneficial scenario, currently, if they suffer a crop failure there is no way a farmer can recover. This is due to the high level of prior investment in fertilisers and pesticides. This leaves their profit margins very thin, in case of crop failure due to drought or floods they will be trapped in a debt cycle. The workshop put in place the early framework for the project. It aimed to enhance the knowledge of stakeholders, including project partners on the identified methodology, processes and their roles in the measurement of change indicators due to shift in agricultural practices. More information regarding the workshop and the project can be found here: https://crzbnf.blogspot.co.uk/p/agenda.html. Adam Walker, Communications Officer, Tel:01224 395095 (direct line), +44 (0)344 928 5428 (switchboard).